Free Shipping & Returns. One Year 100% Guarantee. 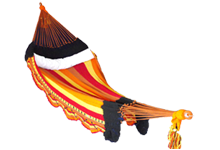 Our Campesino hammock is inspired by the life loving peasants of Latin America. These men and women spend 12 hours breaking their backs in the field each day to hop into a crowded and sweltering hot chicken bus to ride home and pet their dog at the front door, grab a tequila and drink dance the night away. 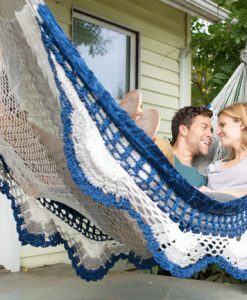 And when it’s time to rest: they’d better have a damn comfortable hammock waiting for them. 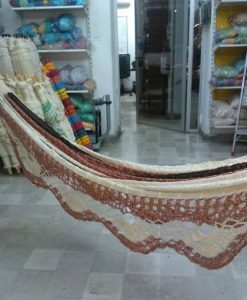 Perfect for use as: an indoor hammock, as a permanent hammock bed, on the patio, or as a backyard hammock. Easy to get in and out of without tipping. 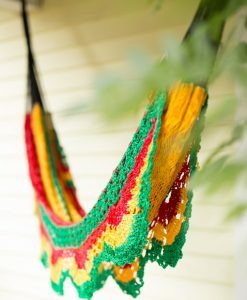 Wooden spreader bars make most hammocks “tippy.” We don’t use them. Neither do the Mayans who weave them. Problem solved! Lying straight puts your back in a “reclined” position with arms supported at your sides. Perfect for reading a book or enjoying the view. Lying diagonally puts you in a flatter position with head raised slightly. Easily adjust to find most comfortable angle (flatter or more upright). Recommended for sleeping. Lying or sitting sideways is fun and great for gently “swinging” back and forth. This is the best method for lying with multiple people. 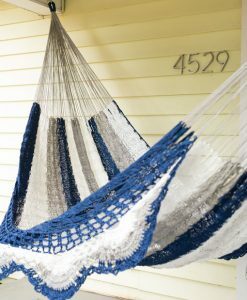 Requires 12 ft. minimum hanging space. More is fine. 100% one year guarantee. No questions asked. Exchanges also available for one year with no shipping cost either way. FREE SHIPPING: We offer free shipping anywhere in the US. Average delivery time is 3-5 days via UPS Ground. Tracking #’s are available upon request by emailing us at service@lazybandido.com. Live Outside the USA? We also ship internationally. The countries listed below are already loaded in our system and will calculate at checkout. If your country isn’t listed please email us at service@lazybandido.com and we’ll be happy to quote a price and delivery time and update our shopping cart for easy ordering. NOTE: All sales are final on international orders. Also be aware that your country may charge import fees separate from our price. Australia: $80. 4-8 days via DHL. Canada: $28. 4-10 days via USPS. UK: $40. 3-7 days via DHL. Spain: $40. 3-7 days via DHL. Japan: $40. 3-7 days via Yamato. Thailand: $75. 3-7 days via UPS or DHL. FREE RETURNS & EXCHANGES: For all orders within the USA we will provide a pre-paid return-shipping label if needed. We do not accept returns for international orders. To return or exchange just email us at returns@lazybandido.com and we’ll send you a pre-paid label. Or just return it without the label and we’ll refund an additional $20 via PayPal. Exchanges will be sent out at no extra shipping cost. 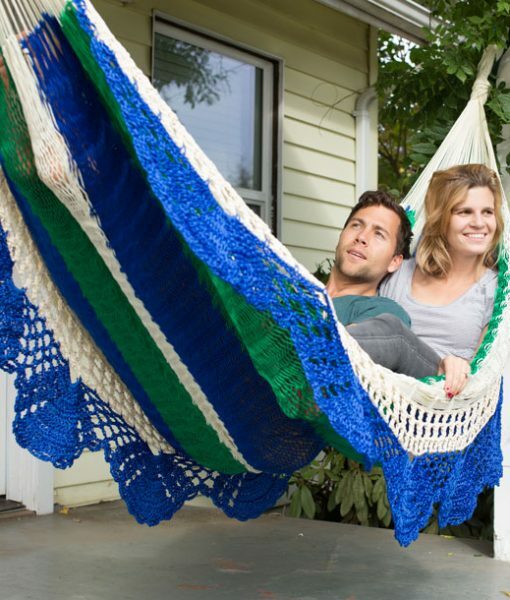 100% GUARANTEE: We make the best damn hammocks out there and we promise you’ll love them. But if for some reason you get shipped off to a Siberian prison and your live-in aunt Thelma wants to return that “gosh darn rainbow-looking pile of yarn” you bought from us we’ll treat her right. 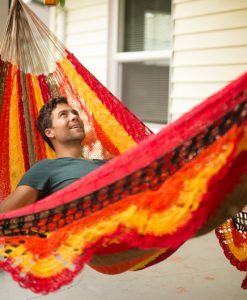 You can return or exchange your hammock for any reason within 1 year from the date of purchase. 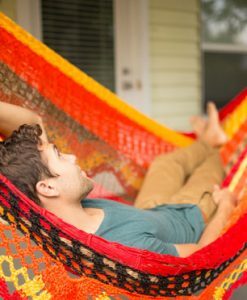 If you’d like to exchange just let us know which style you’d prefer and we’ll ship it back out for free once we receive your returned hammock. At least 12 ft. of space between hanging points. More is fine. 6.5 ft. of height to work with. 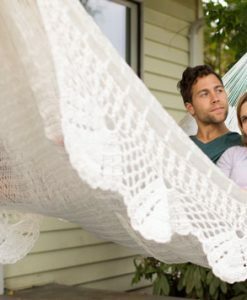 Note: Using a hammock stand? 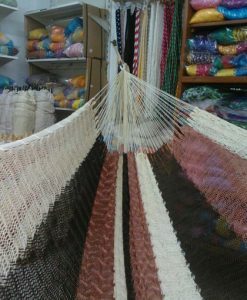 We do not currently sell hammock stands but our hammocks will work with them. Just buy a stand that has hanging points 12-15 feet apart. 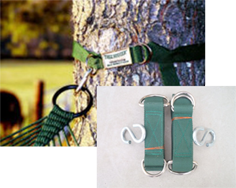 The most important distances are A, B, and C. How high you drill into your wall or tie your strap to the tree depends on how far apart your walls or trees are. 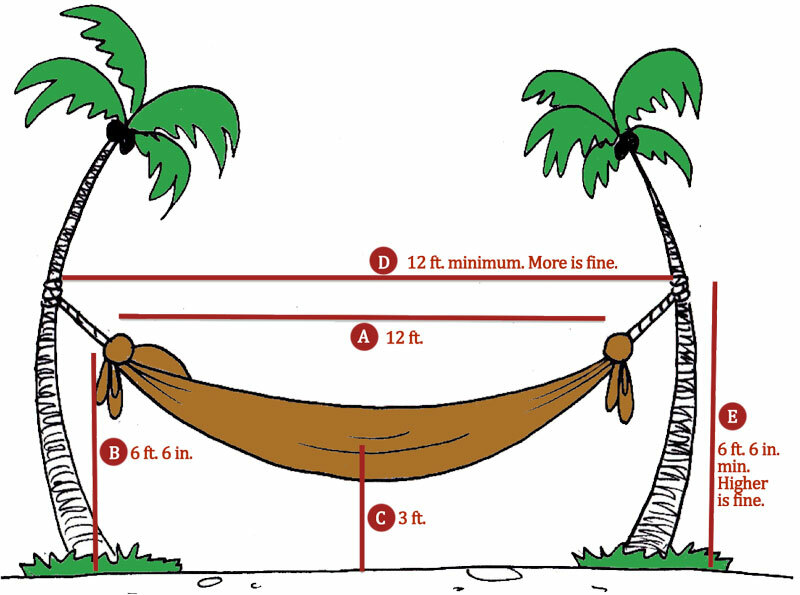 If they’re further than 12 ft. apart simply raise your “hanging point” accordingly so that the hammocks “eyes” remain roughly 6.5 ft. off the ground and 12 ft. apart. Relax, it doesn’t have to be perfect. Just make it look like a banana, and hang low enough to get in and you’ll be fine. Also, it’s OK to hang one end from a wall, another from a post, etc. D) Roughly 12 ft. apart or more. 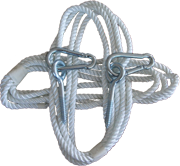 Further apart is fine; just use more rope and raise the hanging point higher. E) Roughly 6 ft. 6 in. or more off the ground. Higher is fine. 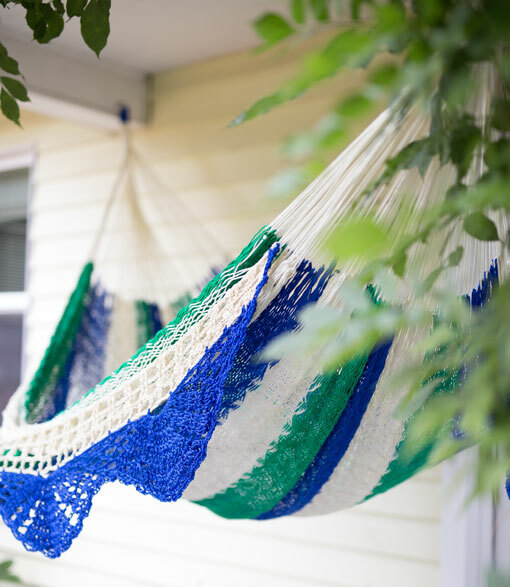 If you must hang lower, than the middle of the hammock (“C”) will be closer to the ground. For example: You can use a hammock stand with hanging points 4 ft. high which will leave middle of hammock roughly 6 inches off the ground. 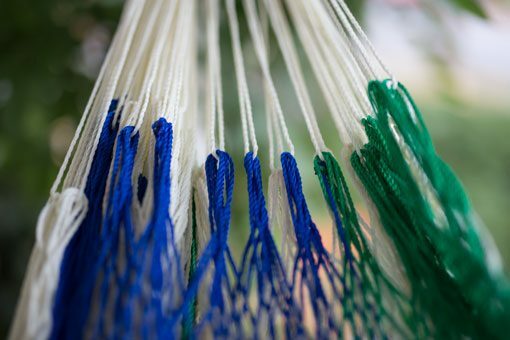 Visit our “How to Hammock” page for quick directions and links for tying hammock knots, using your hammock as a bed, and more. 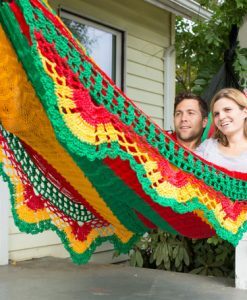 Now that you’ve taken your hammock from your South american alter-ego, take these essential accessories to hang and display your prize. Just click the yellow “ Add to Loot” button to add the item to your loot bag, and click “Checkout above to complete payment. 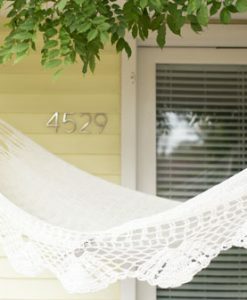 EASILY HANG A HAMMOCK BETWEEN ANY TWO TREES! JUST WRAP AROUND TREE AND PULL TIGHT. 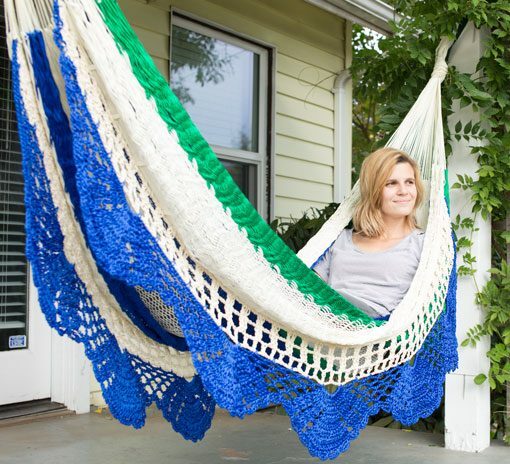 GREAT FOR YARDS, BEACHES AND CAMPING. Buy the Campesino and tell your friends. We donate 10% of our profits on all Campesino hammock sales to charities helping educate Nicaragua’s poor youth.